They were just two examples of the coordinated Web-wide protest taking place against the Stop Online Piracy Act (SOPA), and a companion bill, PIPA. Numerous other major sites were also taking part, according to SOPAStrike.com, a site boosting the protest. 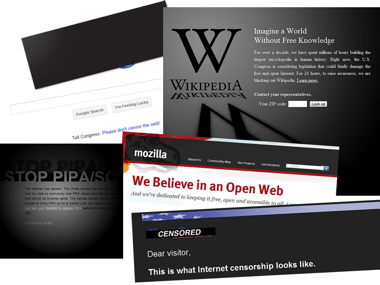 Mozilla and WordPress.org were taking part by blacking out their sites and directing visitors to take-action pages. The Internet Archive was to go dark for 12 hours today, beginning at 6 am PT. Google covered most of its colorful logo in a black banner and placed a link to a take-action page on its home page. Many Internet companies are railing against the bills because, they argue, the provisions included amount to censorship and don’t properly protect sites accused unfairly of enabling piracy. In a post on its company blog, Google chief legal officer David Drummond wrote that the bills “provide incentives for American companies to shut down, block access to and stop servicing U.S. and foreign websites that copyright and trademark owners allege are illegal without any due process or ability of a wrongfully targeted website to seek restitution.” Under SOPA and PIPA, sites like Google could find themselves in legal hot water just for linking to pirated content in search results. “We know from experience that these powers are on the wish list of oppressive regimes throughout the world,” Drummond wrote. Supporters of the two bills argue that the laws are necessary to clamp down on sites that operate outside the U.S., enabling the circulation of pirated films, TV shows and other copyrighted content. The White House had announced over the weekend that President Obama doesn’t support either SOPA or PIPA in their current forms.